If my grandmother didn’t invite me to dinner at Dumpling Restaurant, I would have never known about the place. Tucked away on the side of a small plaza I almost missed it if I didn’t know the address and was given detailed instructions of what to look for. Their dining room is surprisingly large and filled with about 20-25 tables. Unfortunately, because it’s a family run restaurant, they only have two front-of-the-house staff which means service is slow. However, once your table is being served, the food comes out one after the other so despite the sluggish service a meal doesn’t take too long. Let’s start with the dishes the restaurant is named after – the dumplings. There are 17 different types of dumplings on the menu, most based with pork and some sort of vegetable (chives, mushroom, bok choy, celery, etc.). If you’re unable to decide what to have they also have an assorted pork dumpling offering, which we didn’t order, but helps limit the decision making process. Especially if you’re going with a small group and want to try different types. 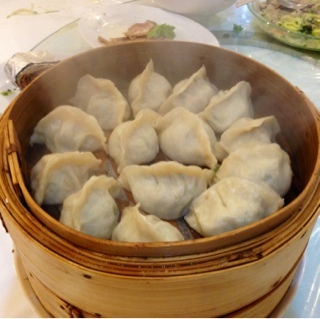 · Chives, egg, pork & shrimp dumplings ($5.99) and pork with mushroom dumplings ($5.99) – We had these steamed and they arrived hot in its bamboo container (yes that is steam in the photo). The wrappers were nice and thin with the juice still trapped in the dumpling and my favourite of the three preparations. · Dumpling with tang hao ($5.99) – tang hao is a type of Chinese vegetable which has a weird acquired taste (not really my preference). For this dumpling we asked the chef to boil them, my grandmother’s partiality. The dumpling wrapper ends up expanding more and staying moist. However, I feel the dumpling loses some of its juices and concentrated flavours. 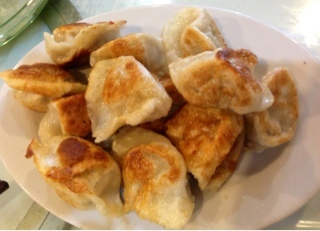 · Fried pork dumplings ($4.99) – nice and crispy and similar to pot stickers except smaller. The Dumpling Restaurant serves much more than just dumplings, they also offer a number of other Shanghainese specialities. 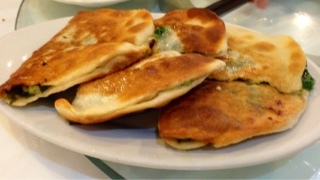 Two of the “pancake” varieties we tried included the pancake with chive & egg ($3.99) which is almost like a Chinese empanada with a fair amount of egg, chives and vermicelli noodles sandwiched in between dough and then pan fried until it’s crispy on the outside. If you like crusty things then this is the dish for you; I found the ingredients inside quite bland; this really needed some sort of sauce to wake it up. 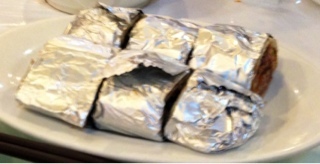 A more traditional pancake dish we ordered was the braised beef & pancake wrapped in foil ($4.99). I apologize for not taking a better picture of the roll itself, but the inside the pancake are slices of beef and vegetables, which is then rolled, wrapped in a foil and toasted. There was a generous portion of flavourful beef inside the wrap itself. My aunt who loves this dish says it’s one of the better ones she’s had. 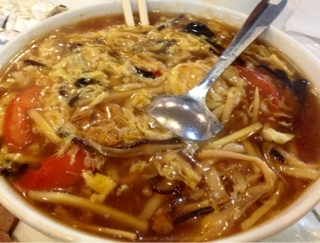 As if the meal didn’t encompass enough carbs, we also had the spicy & sour noodle soup ($5.99). The noodles are house-made but unfortunately cooked too long so they become somewhat mushy. The soup itself is certainly sour but lacks spice so was a bit of a disappointment. They offer other types of noodles like fried noodle, wonton and sauce noodle that may be better options. My grandmother loves fried sticky rice cake ($6.99) so we had to get an order. A bit oily for my taste and needs a bit more sauce to give it flavour. But, there was a good amount of vegetables, shrimp and pork that accompanies the Korean rice cakes and could be a meal in itself. Some non-doughy dishes we ordered included the shredded meat & cucumber with vermicelli ($6.99), which is a misleading named as there is none of the ingredients listed in the dish itself! No meat, cucumber or vermicelli, but rather carrots, eggs, cloud ear (?) 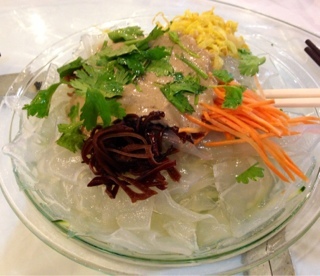 and glass noodles. Nonetheless, once the sesame sauce is mixed with everything the cold noodles are a suitable lighter option especially during the hot summer months. Their sauced beef ($5.99) was the best I’ve had and was wonderfully tender and flavourful. It’s also served cold and meant to be an appetizer to nibble on before the mains arrive. Unlike their other dishes that were a bit bland, the sauced beef was actually full of flavour. Similarly, the crystal pork leg ($5.99) was also good. I’m not normally a huge fan of this dish so only had a small piece to try and found it to be better than most. Dumpling Restaurant is a great find and I can sense I will return in the future. 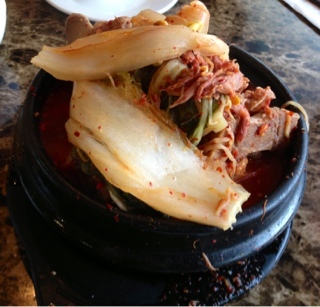 It also offers numerous Korean dishes with the pork bone soup ($5.99). In fact, before the food arrived we were presented with complementary banchans of kimchi and bean sprouts. On a return visit, I tried their pork bone soup ($5.99) which seemed to be a popular choice. What it had going for it was the portion size - it comes with four bones, a bowl of rice, a wedge of potato and two large leaves of napa cabbage, I shared this along with an order of dumpling with someone and we were stuffed afterwards. 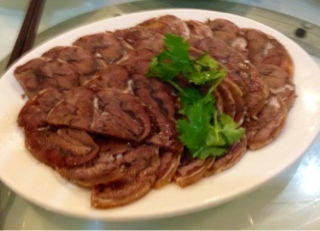 The meat itself is tender and falls off the bone from being boiled for a long time. However, the soup base is not as good as Owl of Minerva's version. Still served in a stone bowl, it doesn't arrive bubbling so although hot it doesn't retain the temperature for as long. I enjoy the spiciness of the broth but like other things at Dumpling Restaurant it's a bit bland so that the pork bones itself is pretty plain. So, if you want the quantity, this is where you go for, but if you want a taste Owl's still the place to go to in my opinion. As a warning again, you will not be coming here for the service or the ambiance. Additionally, the food is a bit bland so be prepared to use the chilli oil, soy sauce or Chinese vinegar included at the table. 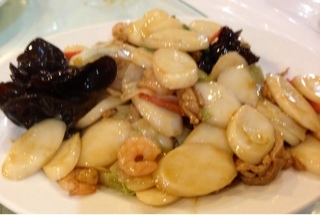 Nevertheless, the dishes are fundamentally delicious and such great value. After all, there are not many places that you can easily feed a group of 10 for less than $100. The only drawback is their portion sizes; if you go with less than four people it’s hard to order many things as there are so many pieces of everything. But, I guess there are worse problems to have.